The enormity of geological history may be appreciated by representing the whole of Earth’s past by a single day. On this scale, the oldest rocks in the National Park formed around 9.45pm, the Carboniferous limestone and sandstone that make up most of the central and southern parts were laid down between 10.10pm and 10.30pm, and the Quaternary ice ages began less than one minute to midnight. Humans first walked across the Northumberland moors at less than one second to midnight. 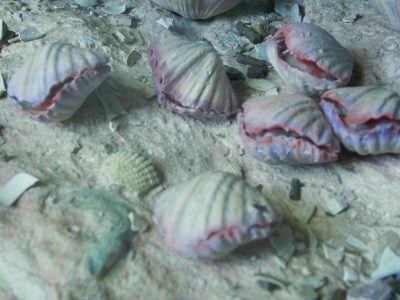 The Silurian Period extended from 443 to 417 million years ago. Named after a British tribe, the Silures, who lived in southern Wales and the Welsh Borderland, where rocks of this age dominate the exposure, the Silurian is divided into four series: Llandovery, Wenlock, Ludlow and Prídolí. Only rocks from the Wenlock Series, dating from 428 to 422 million years ago, are exposed in the district. Now used internationally, the Wenlock Series was first described from the wooded scarp of Wenlock Edge in Shropshire. Because of their limited outcrop these rocks have little impact on the landscape. Much of the outcrop is concealed beneath thick deposits of glacial till and peat. Because of their limited outcrop these rocks have little impact on the biodiversity. These rocks are not known to have had any economic use within the district and future commercial interest is extremely unlikely. None of the outcrops has SSSI protection. Most of the exposures within the district are not thought to be under any significant threat, other than those normally associated with the weathering of natural outcrops and stream sections. 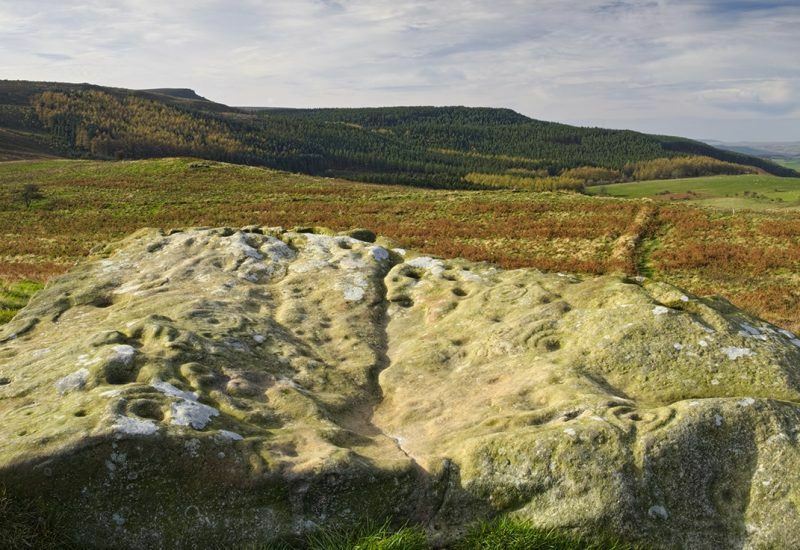 Although covering a relatively small surface area, the few outcrops of Silurian rocks visible within the district are the only evidence of basement rocks within this part of northern England. They therefore contribute significantly to our understanding of the geological history of the area and the geological history of Great Britain. The sediments of the Coquet Head Inlier contain the diagnostic characteristics which are taken to indicate deposition by turbidity currents. Although few in number, the palaeocurrent (direction of ancient water flow) data are important in consideration of British Wenlock palaeogeography. Carboniferous rocks formed approximately 354 to 290 million years ago. The term ‘Carboniferous’, which is derived from the abundance of carbon-bearing coal seams within rocks of this age, was first applied to rocks in Britain and is now used internationally. In Carboniferous times the district lay in the Northumberland Trough, bounded by two fault systems which influenced sedimentation: the North Solway Fault to the north and the Stublick–Ninety Fathom Fault to the south. During Dinantian and early Namurian times over 2500 metres of shallow marine and deltaic deposits, derived from the north and east, were laid down in the Northumberland Trough. This is in stark contrast to the much thinner succession laid down south of the Stublick Fault, on the more buoyant ‘Alston Block’. The Namurian rocks typically comprise thick successions of shales, siltstones and sandstones with some, generally thin, beds of limestone and coals. During Westphalian times equatorial forests of huge primitive trees, ferns and other vegetation flourished on swampy delta slopes and thick deposits of peat derived from the partial decay of this vegetation accumulated from time to time on this surface forming the material that was eventually preserved as coal. The great diversity of form and chemical composition amongst coal ‘types’ is due, in part, to essential differences in the plant material from which they have evolved, as well as to geological processes which progressively altered the nature and maturity of coals. It is likely that rocks of later Namurian and Westphalian age once covered the whole of the district but were later removed. Much of this erosion probably took place in the late Carboniferous and early Permian periods. Rock successions can be divided and categorised in a number of different ways, including subdivision according to the characteristics of the rocks themselves, zonation by the nature of fossils contained in the rocks, or correlation utilising a combination of both methods. Lateral variation in the nature of the Carboniferous rocks across Northumberland has long presented geologists with problems in attempting to correlate them across the county. In 1863, on the basis of the sequence in north Northumberland, particularly in the River Tweed, George Tate of Alnwick, proposed a simple fourfold division of the Carboniferous of northernmost England. Numerous subsequent surveys and publications have added to the complexity of the nomenclature and have, to an extent, tended to confuse matters rather than clarify them. 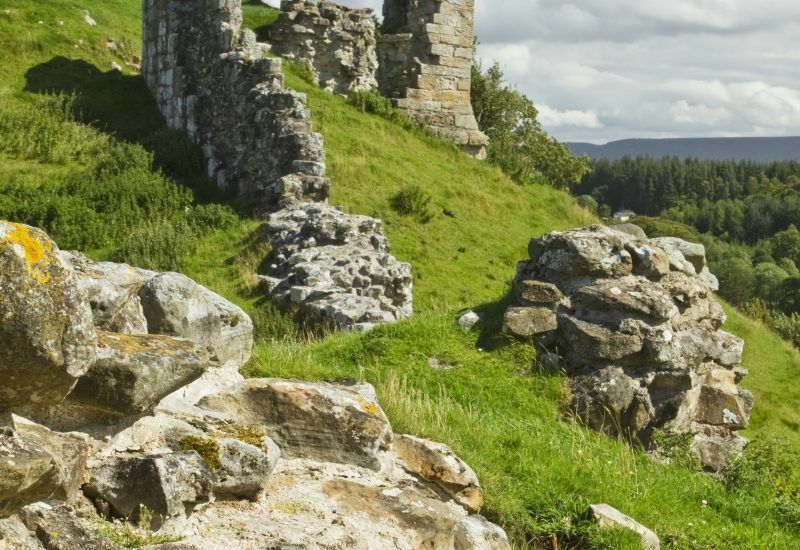 Such a situation is not confined to Northumberland and, in order to clarify regional understanding, a lithostratigraphical scheme encompassing the Carboniferous rocks of the entire onshore of Great Britain has recently been adopted. Although not yet used widely on BGS maps these regional group names will be implemented in future publications. The rocks of these groups are described in the pages below, starting with the oldest. Igneous rocks crystallise from molten lava, or magma, generated within the Earth’s mantle or crust. The buoyant magma rises and much of it may be intruded into rocks at higher levels in the crust to cool and crystallise as igneous intrusions. Large bodies of magma cool slowly forming coarsely crystalline rock such as granite, while smaller masses typically cool more quickly to form finer grained rocks. Kilometre-scale intrusions, with a rounded outline on the map, are referred to as plutons. Sheet-like intrusions that are mainly concordant with bedded sedimentary strata are called sills, and those that cross-cut strata are called dykes. Magma may also reach the surface at volcanoes, where it is erupted as lava or ejected explosively as fragments (including volcanic ash and volcanic bombs) that ultimately form pyroclastic rocks. Igneous rocks may be classified based on their silica content: those with low silica, for example basalt and dolerite, are termed basic rocks, whereas those with abundant silica, such as rhyolite and granite, are acid. Intermediate compositions include andesite and trachyte. Examples of all of these compositions and forms of igneous rock are represented within Northumberland National Park. 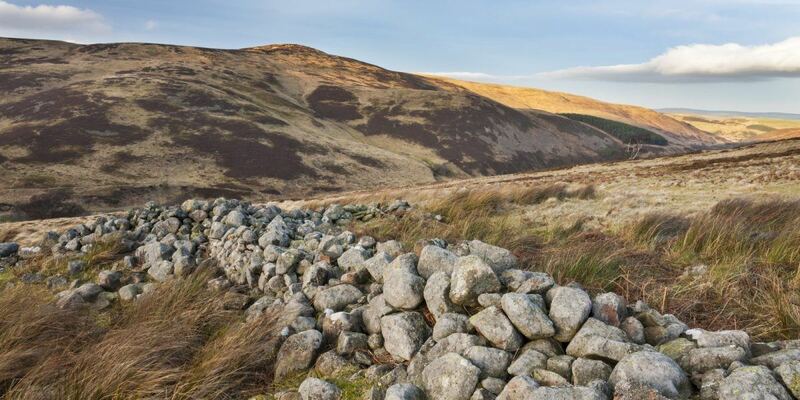 The Devonian lavas and granitic rocks form the massive rounded hills of the Cheviot massif, much of which lies above 300 metres, with the highest point on The Cheviot at 815 metres. The valleys are deep with steepsided convex slopes. The rocks are not well exposed, except in the valley bottoms and on the tors, which characterise the hilltops on the granite, and where the volcanic rocks have been metamorphosed in contact with the granite. Crags are few, though notable exceptions are Bizzle Crags and Hen Hole to the north and west of The Cheviot respectively. In the eastern half of the massif, the drainage pattern that has developed on the igneous rocks is relatively simple and the density of streams is low. This contrasts markedly with that on the western side where the drainage pattern is intricate and dense. The wide, strikingly linear valley of the Harthope Burn has been carved along a major fault through the massif. The lavas of the Cottonshope Volcanic Formation are marked by small, dark-coloured craggy outcrops which contrast with the surrounding outcrops of Dinantian sedimentary rocks. Small, long-abandoned quarries mark the outcrops. Because of their very small surface outcrop these rocks have only a modest effect of the district’s landscape. 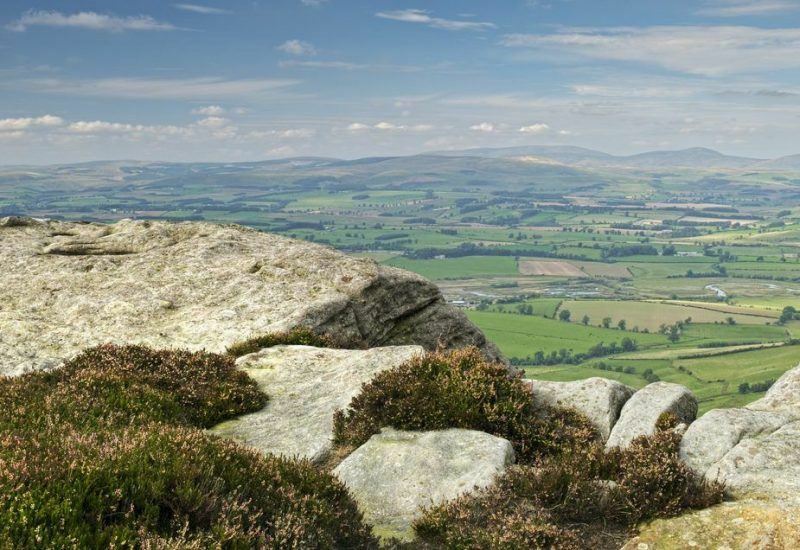 The Whin Sill-swarm is one of the best known features of Northumberland geology and is responsible for some of the county’s finest, and most distinctive scenery. The north-facing cliffs, with the long, gentle southerly slopes, provided the Roman civil engineers with a natural defensive site for the construction of Hadrian’s Wall. The massive, hard and resistant columnar-jointed dolerite imparts a distinctive character to these outcrops, which contrasts strikingly with the generally lower ridges and crags (cuestas) formed by parallel outcrops of Carboniferous sandstone and limestone. The Great Whin Sill was formerly worked on a large scale in quarries at Walltown and Cawfields. Landscaping of the former site has significantly lessened its visual impact as a man-made feature. In contrast, the profile of Cawfields Quarry stands as an obvious interruption to the line of Whin Sill crags. 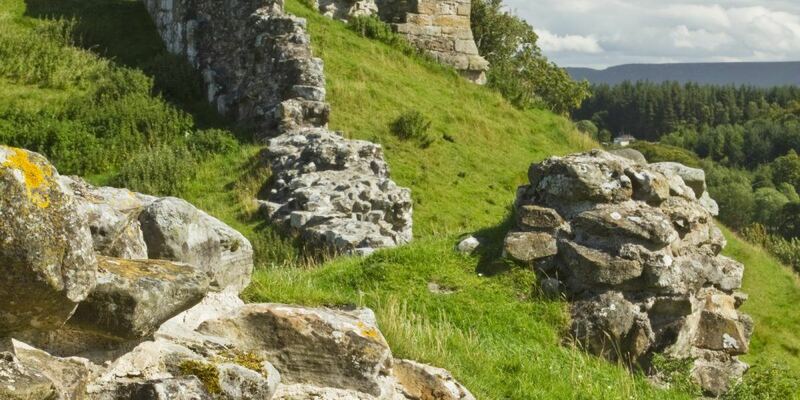 Both quarries offer opportunities to appreciate the nature of the Whin Sill and its role in creating the distinctive landscape of the Hadrian’s Wall country. The crags at Steel Rigg and elsewhere are popular rock climbing localities. East and north of Sewingshields the Whin Sill outcrops are locally concealed beneath spreads of superficial deposits. However, steep escarpments with bare crags of dolerite can be seen at Teppermoor Hill, around Gunnerton Nick and in the Swinburne, Thockrington, Sweethope, Bavington, Fontburn and Kyloe areas. Large working quarries at Keepershield, Barrasford, Swinburne, Divethill, Howick and Longhoughton are conspicuous features in the local landscape, though their visual impact is subject to strict planning and environmental constraints. There are also abandoned quarries at Thockrington, West Whelpington, Ward’s Hill and Ewesley. The steep-sided valleys on the Cheviot volcanic rocks typically host grassland dominated by bent and fescue grasses or bracken, which alternates with areas of broken rock; much of this current pattern of vegetation results from modification by sheep grazing. The screes have sparse vegetation dominated by ferns including lemonscented and parsley ferns. Soils derived from the volcanic rocks are usually base-rich and support some uncommon species such as maiden pink, Jacob’s ladder, common rockrose and hairy rock cress. At higher levels where slopes have lower angles, this gives way to a heather heath/acid grassland mosaic. On the flatter summits extensive areas of blanket bog have formed in the cool wet climate. Here species such as Sphagnum mosses, cottongrasses, cross-leaved heath and cloudberry are characteristic. Arctic alpine species and communities persist on The Cheviot, particularly on ungrazed ledges. Upland lichen species such as Umbilicaria torrefacta, Melanelia hepatizon and Sphaerophorus fragilis occur on Cheviot itself, the Bizzle and Henhole have the richest flora and Cladonia rangiferina has been recorded from Braydon Crag. Where free, or comparatively free, of superficial deposits, Whin Sill outcrops typically support rather thin, acid soils, which in places support a distinctive Whin Sill grassland flora including wild chives, biting stonecrop, rue-leaved saxifrage and mountain pansy. Craggy outcrops, including those in abandoned quarries, offer important nesting sites for birds including kestrels, raven and peregrines, and possibly roosting sites for bats. Neither the Carboniferous, nor the Cainozoic dykes make any significant impact on the district’s landscape; small long-abandoned quarries are still visible in the Acklington Dyke near Cartington. The physical properties of the Whin Sill dolerite make it a good source of roadstone, crushed rock aggregate, riprap and armour stone. ‘Northumberland Whinstone’ has long been exploited for these purposes from quarries across the outcrop. Its intractable nature generally precludes its use as a building stone, though it has been employed locally in a few buildings, notably the now abandoned quarrymens’ cottages at Barrasford Quarry. Large, abandoned quarries in the main sill at Walltown, Cawfields and West Whelpington were once important sources both of crushed rock for roadstone, and as shaped blocks or setts, for road paving and kerb stones. Similar dolerite was formerly worked from the Haydon Bridge Dyke, at West Mill Hills, east of Haydon Bridge: this quarry was backfilled and the site completely landscaped in the early 1980s. It was also formerly worked from one of the Carboniferous dykes north of Bellingham. Very small pits have been worked for dolerite from the Cainozoic Acklington Dyke in the Cartington area, though there are no operating quarries within the present district. ‘Whinstone’ quarrying remains an important industry in Barrasford, Swinburne, Divethill, and, just outside the district, Howick and Longhoughton supplying crushed dolerite products for use widely across northern England. On the south side of the Cheviot massif, the small intrusion of Devonian age near Biddleston has been worked for crushed rock and roadstone at Harden Quarry [NT 958 086]. The natural bright red colour of the rock makes it sought after for specialised uses such as surfacing the hard shoulders on Britain’s motorways and, perhaps most famously, for lining The Mall in London. The Cottonshope basalts have been quarried on a modest scale, probably mainly for local use as roadstone and walling stone. There is extensive use of local volcanic stone for walling despite its round profile. Future working of any mineral deposit is dependent upon a complex range of commercial and planning considerations, but it seems likely that demand for roadstone, crushed rock and the other products currently extracted within the district will continue for the foreseeable future. Substantial reserves of rock of satisfactory quality are understood to remain at several, or all, of the working quarries within the district. Additional workable reserves of dolerite capable of meeting commercial specifications could no doubt be identified within the district, though planning and environmental conditions would have to be met in any proposals for working. The natural exposures of igneous rocks within the district are generally robust and none appears to be under threat. Working quarries typically provide excellent representative sections of the geology, but by definition quarrying destroys the materials worked. However, the continually changing nature of the sections can yield invaluable insights into the rocks exposed. Accurate recording of such sections, accompanied by the collection and curation of representative specimens, can play a vital role in maintaining and furthering knowledge and understanding of the local geology. By contrast, abandoned quarries are potentially at risk of becoming degraded or overgrown, either due to natural deterioration or by inappropriate after-use and management. The planting of trees adjacent to the fine Whin Sill section at Walltown Quarry may be cited as an example of inappropriate management of a valuable and instructive geological site. The use of old quarries for landfill may threaten to damage or totally obliterate important sections, though none is known to be under any such immediate threat within the district. The quarry faces at Cottonshope Head Quarry are now rather weathered, and in places degraded. Consideration might be given to restoring this section. The district also includes several abandoned quarries which, because of the significant geological features exposed, merit consideration for protection. Of particular note are the sections through the Whin Sill and adjacent country rocks at Ward’s Hill Quarry. 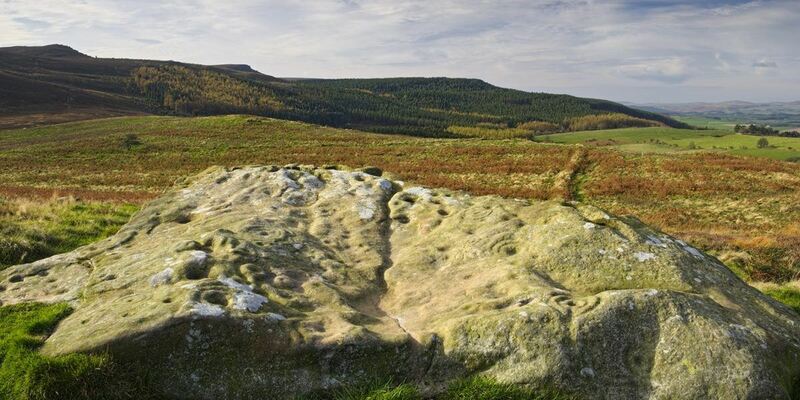 In addition to the range of geological features exposed here, the site has considerable historical significance for its place in the development of ideas on the nature and origin of the Whin Sill. Exposures of the Acklington Dyke and adjoining wallrocks at Cartington, though comparatively modest, offer a rare opportunity to examine this important, though otherwise poorly exposed, intrusion. The Scroggs is an example of an SNCI listed for botanical interest that has geological links. This is an exceptional piece of grassland on the contact zone between the Whin Sill and limestones in the Tyne Limestone Formation. The pasture is among the richest found on any of the Whin Sill sites and its flora is outstanding with many species uncommon in north-east England. The Cheviot volcanic rocks and Cheviot Granite are among the southernmost occurrences of a suite of igneous rocks of late Silurian to Devonian age, the members of which are distributed northwards to Orkney and Shetland. Volcanic rocks of this suite form such notable areas as the Ochil and Sidlaw Hills in the Midland Valley of Scotland, and the caldera-volcano at Glencoe in the Highlands. 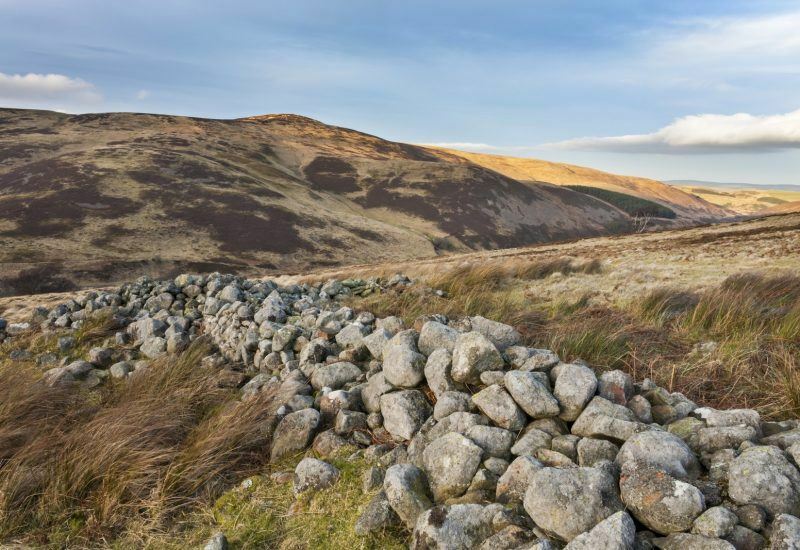 Though modern studies of the Cheviot rocks are few, these rocks contribute to our wider understanding of this important phase of igneous activity in the evolution of the British Isles. The Whin Sill is generally regarded as the original sill of geological science and therefore has to be regarded as one of the district’s most important natural heritage features. It takes its name from the north of England quarryman’s term ‘whin’, meaning a black, generally hard and intractable rock, and ‘sill’, meaning any more or less horizontal or flat-lying body of rock. Recognition of an intrusive igneous origin for the Whin Sill during the 19th century was based largely on studies within the present district, notably on sections exposed at Ward’s Hill Quarry. Consequently, the term ‘sill’ became adopted by geological science for all near-horizontal and, within stratified sequences, broadly concordant, intrusive igneous bodies. Since then, many studies of the Whin Sill-swarm and its associated dykes have drawn upon evidence gathered from its exposures in Northumberland and much of the large volume of earth science literature derived from these studies has significance well beyond the county. In addition to its geological importance, the striking geomorphological expression of the Whin Sill, and its exploitation by the Romans, has produced an internationally recognised landscape. Allerhope Burn, Barrasford Quarry, Toddle, Reaver, Blindburn, Canker Cleugh, Carshope, Cawfield Crags, Divethill and Claywalls, Earlehill Quarry, Flodden Quarry, Fredden , Preston Yeavering Bell, Haltwhistle Burn, Harelaw etc. Burns, Horsdon Channel, Kyloe Hills, Raker Crag, Shiellow Crags, Shillhope Cleugh, Upper Breamish and Bloodybush Edge, Usway Burn, Walltown Quarry and Crags, Windyhaugh. Metamorphic rocks have formed through the alteration of other rocks by heat or pressure, or both. The original constituents of the rock may have been recrystallised to produce an assemblage of new minerals, textures and grain size. Metamorphism is the term applied to these processes. During mountain building, rocks buried deep within the Earth’s crust may be affected by both intense heat and pressure, or by pressure alone, and hence undergo regional metamorphism. By contrast, when igneous rocks are emplaced the adjacent rocks are heated by the intrusion and experience thermal, or contact metamorphism; the zone of affected rocks surrounding an intrusion is known as a metamorphic aureole. Several of the tors in the higher parts of the Cheviot massif are developed on contact metamorphosed volcanic rocks. In addition to those mentioned above, tors in hornfels are present to the west of the granite on The Schil [NT 870 223], West Hill [NT 894 213], Auchope Cairn [NT 892 198], and Hanging Stone [NT 892 190]; to the east are Middleton Crags [NT 977 215]. Because of their very limited extent, contact metamorphic rocks associated with the Whin Sills have a little or no impact upon landscape in the district. Because of their very limited surface extent, contact metamorphic rocks within the district have very limited impact on biodiversity although some species may persist on ledges away from grazing animals. The metamorphic rocks in the Cheviots often have a rich lichen flora with good mosaics of crusts competing for space. None of the metamorphic rocks of the district have been specifically exploited. However, some of the harder calc-silicate-rich rocks, formed by thermal metamorphism of the Oxford Limestone within the contact zone of the Whin Sill at Barrasford Quarry, are included within certain crushed whinstone products supplied by this quarry. Apart from such use it is extremely unlikely that any of the district’s metamorphic rocks will ever attract commercial interest. Natural exposures of metamorphic rocks within the district are mainly closely associated with exposures of intrusive igneous rocks and, like them, may be assumed to be generally robust. Comments made on the conservation of intrusive igneous rocks in working quarries, applies equally to metamorphic rocks. Despite the great importance of the Whin Sills in the development of understanding of such rocks, as evidenced by the voluminous technical literature on their form, composition, age and mode of origin, little attention has been directed towards the metamorphic effects associated with them. 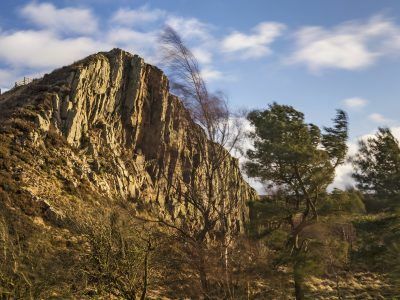 Thus, although of limited extent, the metamorphic rocks associated with the Whin Sills, in particular, offer considerable potential for future research on metamorphic processes in such geological environments. Although the volume of metamorphic rocks within the district is small, they are extremely important in giving clues to the district’s geological evolution. The Quaternary Period spans the past two million years, a time dominated by a succession of ‘ice ages’. The process of glaciation, the scouring of uplands by flowing ice, and the subsequent transport of material by ice and meltwater flow into lowland and offshore areas, produced distinctive sediments and landforms. During the Holocene Epoch (the last 11,000 years), following the decline of the ice, the landscape has been dominated by less dramatic processes. Holocene sediments in Britain include peat and alluvium, both of which give vital information regarding the climate and environment since deglaciation. The study of Quaternary deposits and landforms enables links to be made between the behaviour of ice-sheet systems across continental-scale areas, and the mechanisms and processes of climatic and oceanic change. Throughout much of the Devensian glaciation large areas of Northumberland lay beneath fast-moving, dynamic parts of the British ice-sheet. The effects of warm-based ice streams can be seen in the landscape surrounding the Cheviot massif, in the Tweed Basin and Tyne Gap, where they have effectively moulded and streamlined the land. However, the Cheviot massif appears to have deflected much of the streaming ice around it to the north and south, remaining relatively unaltered. In the lee of the massif lay an area of slower-moving ice, and during deglaciation this difference in velocity had a significant influence on the resulting landscape character. Quaternary deposits by their very nature and wide distribution have the biggest influence of any geological deposits on the biodiversity of the district. These deposits and the vegetation that they now support have however been substantially modified by humans and what we see now is only a snapshot in time. Future climate change and management will have a strong influence on biodiversity. There is significant lateral discontinuity of different Quaternary units, which contributes to changing soils and ground conditions over very small geographical areas. Possibly the unit supporting the most diverse flora and fauna is Holocene peat. The internationally important Border Mires in the Hadrian’s Wall area and other raised mires are home to a wide range of plant, insect and animal life including sphagnum mosses, sundews, bog rosemary, large heath butterfly and wading birds such as dunlin. The blanket peat habitats in the Cheviots and Cheviot fringe areas are generally less diverse but do support sphagnums, cotton grass and, at higher altitudes, cloudberry. Areas of till tend to have been cultivated over the centuries, and most of these areas are now pastureland and do not support significantly diverse ecosystems. The exceptions to this are the few remaining species-rich hay meadows (once more widespread). The free-draining soils overlying much of the glaciofluvial deposits in the Cheviot fringe have allowed widespread agriculture, hence much of the biodiversity there has been significantly modified by the actions of humans. Clearance of natural woodland and maintaining open ground by grazing has replaced shrub and woodland by moorland habitat across large areas. This habitat characterised by Calluna heather, with other dwarf shrubs such as bilberry, cowberry and bell heather is now considered important in its own right and sites such as the Simonside Hills and Harbottle Hills are considered internationally important. In other areas grazing has reduced the vegetation to a less diverse acid grassland mosaic. Large scale post-war planting of coniferous forests in some areas has replaced natural vegetation including areas of peatland, but restructuring and felling is reversing this in some areas. The extensive spreads of glaciofluvial and Holocene age alluvial sands and gravels in the district have encouraged a fairly high level of extraction in the past. The alluvial terraces of the Tyne are regular in depth and are predominantly composed of graded gravels, the finer material having been washed out. These terrace gravels tend to be primarily composed of Carboniferous sandstones with some lower Palaeozoic greywackes, with limestone and some igneous rocks. Extraction has taken place all along the Tyne from Gilsland in the west, to Crawcrook in the east, with numerous small-scale pits being worked predominantly in the alluvial terrace material. Possibly the most extensive working of the glaciofluvial material has been at Prudhoe Gravel Works. The Milfield Fan is predominantly composed of sands and graded gravels. There have been extensive sand and gravel workings at Woodbridge Farm Quarry at Milfield since the 1960s, and this quarry is still in operation. The Lanton Quarry is set to continue working after Woodbridge Farm Quarry has closed, and in 2000 had estimated reserves of 1.8 million tonnes. Further to the south Branton and Low Hedgeley quarries have also produced significant yields of sand and gravel, though their operations are winding down, with the Branton site now having been largely restored to artificial lakes. At Thrunton the brick clay quarry continues to extract laminated glacial lake clay. Traditionally, peat has been drained and cut for fuel in the district, but in recent years it has been extracted on a commercial basis and sold for horticultural use. Peat is currently extracted at two sites in Northumberland on the north-eastern margin of the district, Kemping Moss near Lowick and Greymare Farm near Belford. Extraction at a third site, Bell Crag Flow, within the National Park, has ceased and the site is being restored by blocking drainage ditches and removing self-seeded conifers. There is now a presumption against opening new peat extraction sites as the peat habitats are now recognised as being important for biodiversity, carbon storage and water retention. Even though the Tyne valley has extensive sand and gravel deposits, it is clear from the scale of historical extraction that they have limited future potential. The deposits occur in narrow units (less than 500 metres lateral width), and are less than 10 metres thick in most places. Other UK sources of such material are more economically viable. By far the largest potential future source of sand and gravel resources remains the Milfield Fan. However the extent to which it has already been excavated may prevent further development due to fears over the complete loss of the feature. The Milfield Plain may prove to support thick sequences of glaciolacustrine (related to the glacial lake) muds and sands, of use to brick clay and sand resource industries. 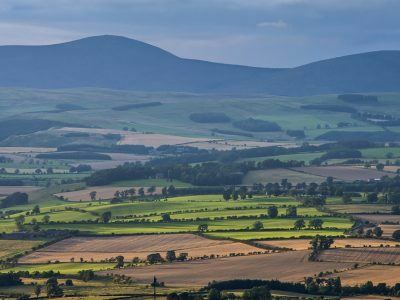 However, this area of high quality land is currently extensively farmed, and is beneath the eastern flank of The Cheviot, close to the National Park borders, and thus any proposed extraction may meet with local difficulties. The proximity of sites to the National Park renders the area sensitive to further large-scale resource extraction and stringent planning and environmental conditions would have to be met in any proposals for future working of the sand and gravel deposits. The Quaternary deposits of the district are largely robust, and current farming and resource extraction practices have had little effect upon their overall distribution and stability. However future development of the Tyne valley floodplain and possible sand and gravel extraction could remove possible key sites and sections with the potential to lead to greater understanding of icesheet behaviour in the region. The glaciofluvial and river terrace sequences of the Tyne, around Haltwhistle and Hexham give clues to the late glacial and Holocene drainage history of the area, which is yet to be reconstructed. Future development of the Milfield Plain area with associated sand, gravel and brick clay extraction may begin to remove possible key sites and sections that may lead to greater understanding of ice-sheet behaviour in the region. The Quaternary landscape of the district is one that has increasing significance for the earth science community. Understanding of ice-sheet behaviour is evolving rapidly. Our interpretation of deglaciated landscapes is now heavily influenced by modern polar studies, and this has led to our increased knowledge of the behaviour of the British ice-sheet. Using this increasingly complex model, inferences can now be made about the effects of past climate change on this dynamic ice-sheet, and also on the effects of sea level rise and subtle variations in internal glacial processes. The Hadrian’s Wall area exhibits the classic landscape of a palaeo-ice-stream track, now recognised as being highly significant in the regulation of the mass balance of ice-sheet systems. The Cheviot fringe area, with its extensive lake, fan and glaciofluvial deposits may provide significant opportunities for earth scientists to add vital pieces of information to our fragmentary record of the period during and immediately after the decline of the last great ice-sheet in Britain. The lake bed of palaeo-Lake Milfield is a potentially vital source of environmental data relating to the collapse and disappearance of the last great ice-sheet in the region, some 15 000 years ago. Lake sediments may contain records as diverse as pollen, diatoms, volcanic ashes or tephras and beetle and plant remains that may give detailed and high resolution information regarding this critical period in recent Earth history. There are also gaps in our knowledge about the vegetational history and human impact upon it. Particular omissions in the record exist in the north and western parts of Northumberland. Examination of Quaternary deposits, particularly peat habitats, could yield important information. This links to the NNPA archaeological research agenda and should build on previous palaeoenvironmental research in the region. 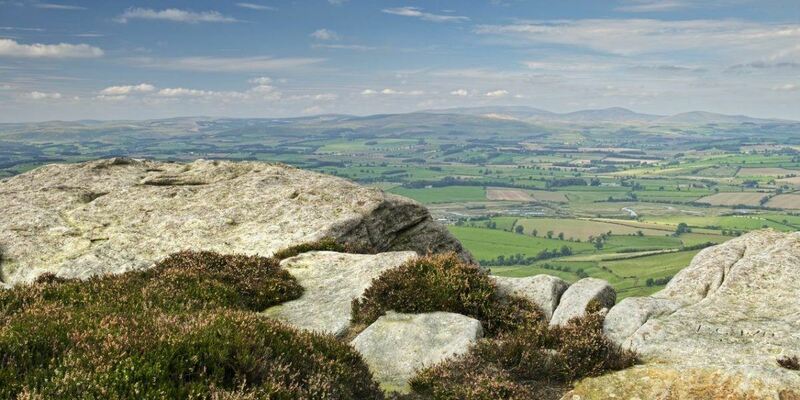 The Quaternary landscape of the Cheviot massif appears to be very unusual in Britain. It is an upland area that has undergone glaciation during the Quaternary, most recently during the Devensian. However it still preserves features relating to the action of longer term, less physically dynamic processes, i.e. tors and deeply weathered bedrock. The preservation of these normally sensitive features in a landscape that has undergone glaciation is extremely unusual. Understanding why this occurs is a key challenge for future scientists, as it appears to stand contrary to accepted wisdom concerning glacial erosion in upland areas, namely that glaciers perform large amounts of geomorphological work throughout a glacial cycle. If the landscape of the Cheviot massif is inherited from an earlier period of Earth’s history, then this assumption must be challenged. Learn about park places notable for fossiled remains. Have you ever wondered what lies below your feet? Enjoy stunning wildlife, unique habitats and incredible geology.